Russia's Ludmila Nelidina, a 17-year-old figure skater from Moscow, made history at Skate America in Spokane. Russia’s Ludmila Nelidina, a 17-year-old from Moscow, made history at Skate America in Spokane, Washington when she became the first Russian and first European woman to successfully land a triple Axel in competition. Even more amazing was the fact that her achievement came only minutes after Japan’s Yukari Nakano became the first woman in ten years to successfully complete the jump. At five feet, four inches tall, Nelidina also became the tallest woman to complete the jump. Nelidina, who started to practice the triple Axel and the quadruple toe loop when she was 12 years old, said modestly, “There’s no secret to landing the triple Axel. I like the jump and I know when I compete that I am going to try the triple Axel. I’ve had it in my program for the last two seasons and landed it three times in competitions in Russia. This was the fourth, but it was the cleanest one. It’s important to me that I did the cleanest one here. But everyone has their own special abilities and talents. It’s not really special.” She is planning to add the triple Axel to her short program later this year, then hopes to add the quadruple toe loop to the long program next season. Nelidina finished fifth at Skate America and sixth at Cup of Russia to add to her bronze medal from the Nebelhorn Trophy earlier this season. Last season, she finished sixth at Russian Nationals and second at the ISU Junior Grand Prix Final. 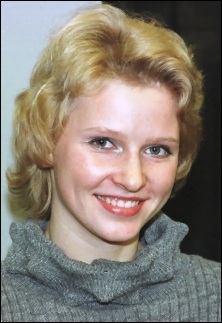 She won both the Nebelhorn Trophy and Trofeo Rita Trapanese in Milan in 2001. Her goals for the season is just to “skate extremely well everywhere.” She doesn’t have a specific placement in mind. Nelidina is currently in her second year at the sports institute in Moscow so she spends a lot of time studying. For relaxation, her main pastime is drawing. “Sometimes I draw portraits, sometimes nature. It depends on my mood,” she said. Nelidina also likes to read and walk her two dogs, a dachshund and a Staffordshire terrier.